For many years, MM17, MASS and other SAP transactions were the preferred method of making changes to data in production systems. I used to do it myself, when I was lucky enough to have access to them. Soon most security teams figure out this can be dangerous and take away 99% of users access to the transactions. For the uninitiated, MM17 allows mass maintenance of a field on many records to one value. Which can be useful if you want to block all of your materials before a product line change, but it isn’t a good way to make small scale changes. It is a front loader, when most of us need a gardening spade. We have been working with a couple of TRANSACTION customers lately who tried to use TRANSACTION with MM17 since MM17 is what they are used to. This isn’t the best way to use TRANSACTION, so it was just a matter of determining what they wanted the process to really be. Changes in business data is never as easy as A should now be X. It is more like A can be B, C, D, E, or F. Doing this kind of transformation in MM17 can take days. We showed our customers an example of a spreadsheet solution that allowed for real data transformation. Excel provided the canvas for them to draw out what the new data set should look like. They did one upload into MM02 for all of the different materials that were being changed. Each record now reflects it’s unique changes and the audit trail is maintained for each change. 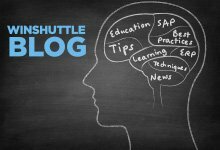 The challenge that we face is simply to think differently about how and why we do things in SAP. We can’t just keep doing the same thing over and over again and expect better results. We have to look for a new path to get to the end result we are looking for.